FlashForward: Mystery and Suspense on Television. Chaos reigns in Los Angeles after a mysterious event causes everyone in the world to lose consciousness at exactly the same moment. Was it an act of nature? Something man-made gone wrong, or something even more sinister? Whatever it was, every person on Earth blacks out for two minutes and seventeen seconds and sees a series of events from their own future, taking place on April 29, 2010 at 10:00 p.m., Pacific Time. For some the future will be joyous and hopeful; for others, shockingly unexpected; and for a few, it simply doesn't seem to exist. 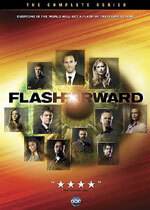 FlashForward debuted on ABC in September 2009 as an action thriller with a large ensemble cast. The series is based on the novel of the same name by Robert J. Sawyer.